I don't know how much of this I can take. There maybe some confusion about velocity air stacks because of some custom early motor K-bikes pics floating around which appear to have them. There are several project bikes which have used a single stack filter. We're all here to help you find out, bill. I looked up the internet and your correct, they called throttle body. My mistake. I'm learning on the go, looking up thing and in the meantime i'm cleaning and cleaning. @ Laitch & True Ace. What about this bike then ? Cannot find a propper discription of what they did to make it work without the air flow meter. And this guy is just leaving the air flow meter out and testing with the flow. small bores flow well up high but big bores need a little more length to stretch the induction stroke lower down in the rev range ...we already have the length and reduced size in the exhaust headers on the 2 valve models ...but have to do something with the intake I recon . And here we go with the tank. Using 3,5 bar, the paint is ready hard so I have to be very patient to get all off properly. 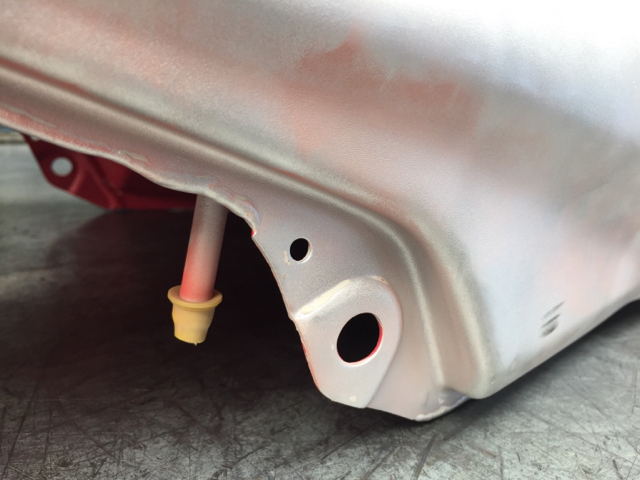 On my last cafe build I used "orange stripper" to strip the fuel tank. It works great you just "glob it on" and let it sit and bubble the paint off. It's made from orange oil but won't take your skin off wreck your clothes or kill brain cells like the old furniture stripper/naipalm stuff I used to use. It smells like orange juice and cleans up with water. This was a question about the air flow meter. You should consider that when you don't seem to understand the differences between a carburated fuel system and fuel injection, or between one engine model and another, you probably will get some comments that don't make sense to you, or make statements that don't make sense to others. All the information you need to understand the differences is online already. It just takes patience to read them carefully—you seem to have patience. A simple way to see basic component differences is go to the MAX BMW parts fiche and look at the fuel preparation and other diagrams of the different models. You seemed determined to make a great project out of this bike so you probably will. Good luck with it. I hesitate to pipe in cause I am new to this bike myself and figuring it out as I go like you. Thanks for you kind reply, in the first time I wasn't aware of the FI system because i saw the other bikes first before I took all apart. 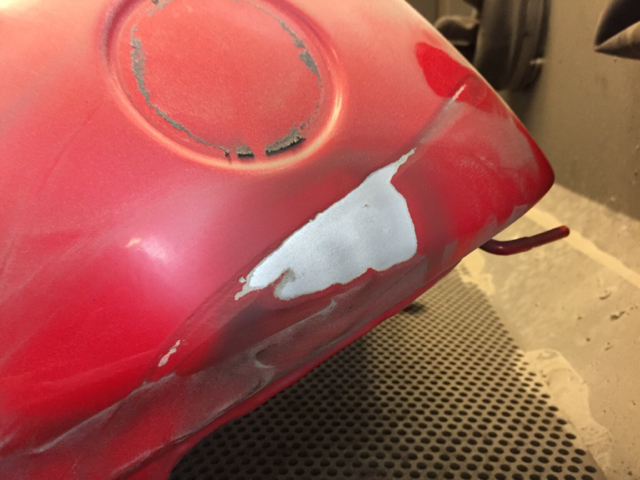 For now I will leave the stock air box and so for what it is and focus on the rest. But the idea which you send of the air filter 90 degrees would be a option for later on. PS: This bike has also a different air filter. 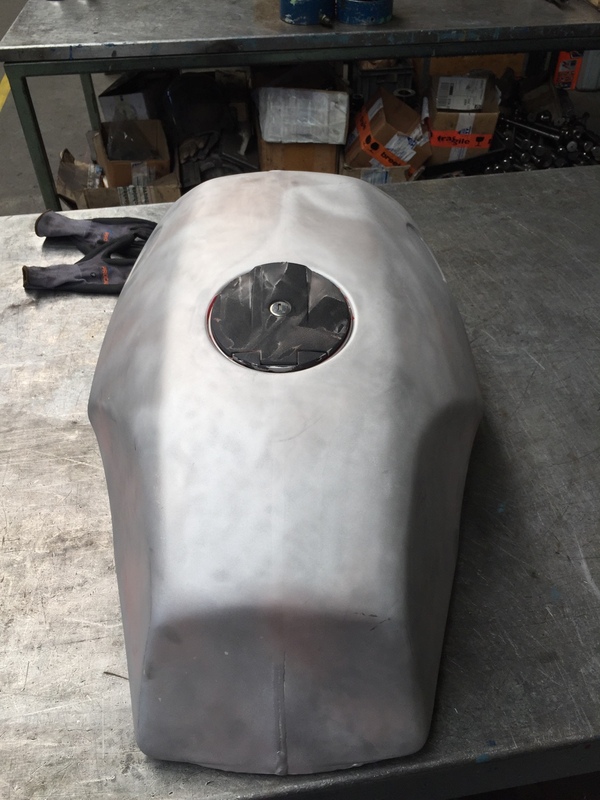 Tomorrow I will finish sanding the tank and go to the paint shop to get a nice mat black hard paint of the tank and the wheels. And also again do a lot of cleaning the frame and parts. Hopefully my parts will arrive soon to finish the front fork. After that the rear and exhaust are up the agenda. The Pipeburn link to the Bell Kaff shows a highly highly modified K1100 frame strapped to a K1200 motor with a K1200 transmission and customised rear. The early K1200s use Bosch Motronic fuel injection. Thus, the Bell Kaff can use velocity stacks since there is no air flow meter as in a Jetronic. If you want to read more about Larry's bikes, especially this one, then go to his site - www.specialks.net - and click on the Media link. 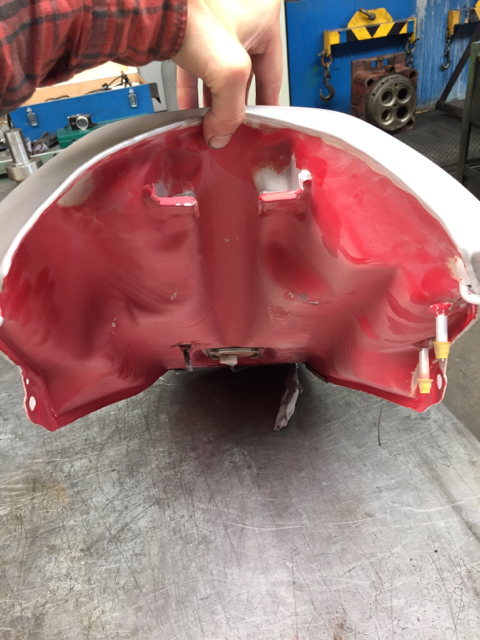 I recall a project bike from Alaska that placed a single cone filter off the back under the seat using a custom housing to hold the AFM, and using a lithium battery to replace stock so the space would be freed. Many folks strive for that open look by going to a lithium. What are you doing with the battery? I left the air box alone just for simplicity, but did ditch the snorkel. Looks good !! Also you took off the "eyes" from the tank. (I dont know how to call them) most people leave them on even when they do a paint job. The snorkel is off for now, I'm placing a mesh gasket where the snorkel schould be. For the battery I want a really small one but not sure where to place it. I'm making a bike with a double seat to get the GF with me so I dont have space to get it in the seat. But I will figure something out. Regarding the footpegs you just cut them off to a single one? Correct, and cut down the seat pan, but you could configure for a passenger, just don't cut too much off the rear subframe. My battery is lithium hidden in the modified relay box, after removing superfluous relays......tight squeeze. And yes all good builds should eliminate the useless tank eyes! Keep the pics coming. 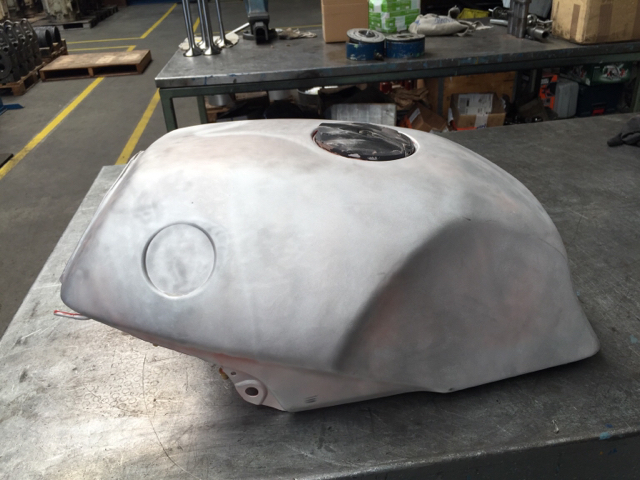 Here are some pic's of the tank, sand blasted. I kept the original paint on the bottom because this paint is really hard and good. 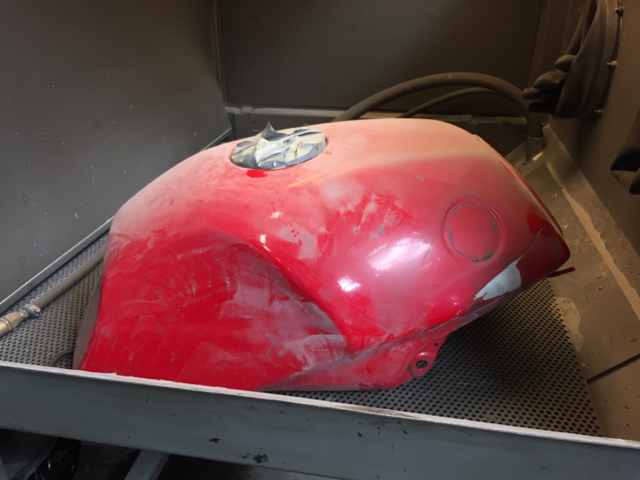 Therefor no one would see it because the tank will be painted completely. Taking of the eyes and so of the tank will be done later on. 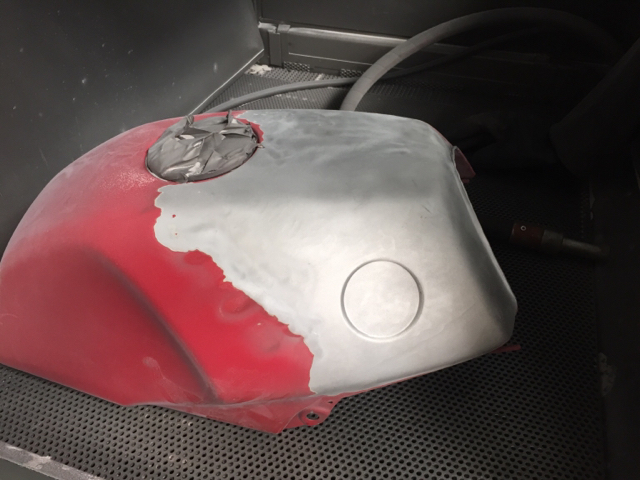 Well when I didn't got the option to sand blast the paint of I would do it the same. Ah a scambler, in my case I need to keep the signal lights, horn, flash etc.. so thats not a option. I think I will go for a very small flat battery to fit under the new seat max hight 5-7cm. I will search the i-net and post some battery's up here. I put grease on the injector top o-rings and inside the cups but cant get them on. I mean I dont want to force anything or brake the injectors. You did it backwards. Install the injectors onto the rail, then install the rail + injectors into the engine. Don't forget to blow out the injector recesses with compressed air and clean up any debris before removing the injectors from the block. You don't want road grit and rocks in your intake system. I had same issue. Much easier with them attached to the rail and putting all 4 in. I also sprayed the rubber o rings with WD-40 made them slick and "pop" into the sockets much easier. The WD-40 will evaporate but even if you get it in combustion chamber it won't hurt anything just smoke a bit for a while. Great thanks guys I will try that. 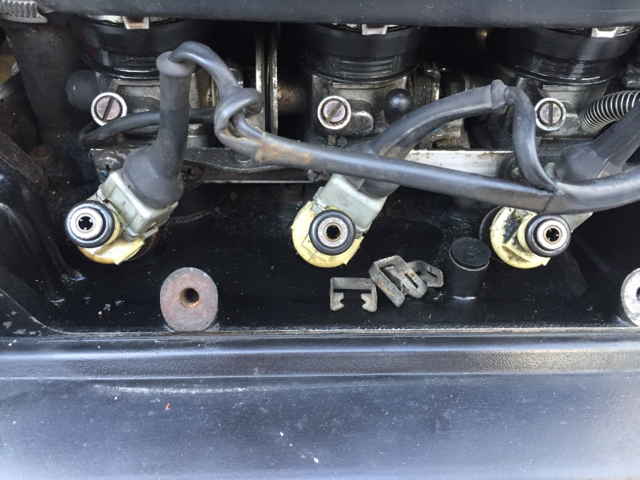 How to get the injectors out properly, I tried to pull them out but I think a need a quite force to do it? It can sometimes take force to extract them. They are only held in place with O-rings, similar to the ones you can see on the tops of the injectors. Try a little more force inline with the injector; it's possible its age and the O-ring is just very stuck. It can sometimes take force to extract them. Call on some friends to hold down the bike, Nick, and have a party doing it! Hahahahahahaha Laitch, you'v made my day for so far. Regarding the battery, I found this one on the internet and i'm curious if some has some expirience with it. I used the search button but nothing came up on ultrabatt. What is the minimum power the K75 needs to start up, I found: 12 VOLT, 30 AH ?